Elbows are short curved tubular pasta in a semi-circle shape. Elbows are versatile because of their short cooking time and familiar shape. 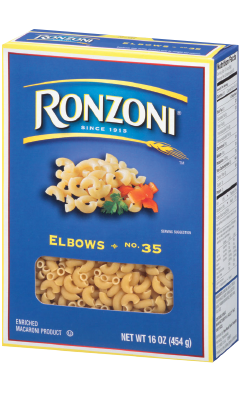 Most commonly associated with "Macaroni & Cheese", Elbows can also be used with tomato-based or creamy sauces in entrées or in salads, soups and baked dishes. Available in 8 and 16 oz.